Thanksgiving Crafts ~ Whether it's a feast for the whole family or a simple Thanksgiving lunch for a few, these easy embellishments can turn any meal into a festive holiday affair. Get your Thanksgiving tabletop craft inspiration from the fall harvest season with these corn husk placeholders from Freutcake. 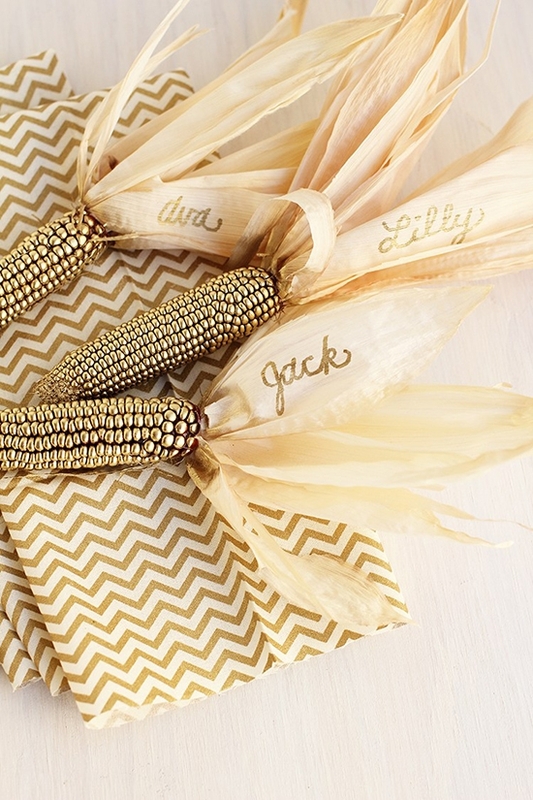 Ears of corn spray-painted gold go from produce to Pinterest-worthy Thanksgiving table decor in minutes. Use a gold paint pen to scribble each name onto the husk for a country-glam vibe your guests will love. This project's a wrap. 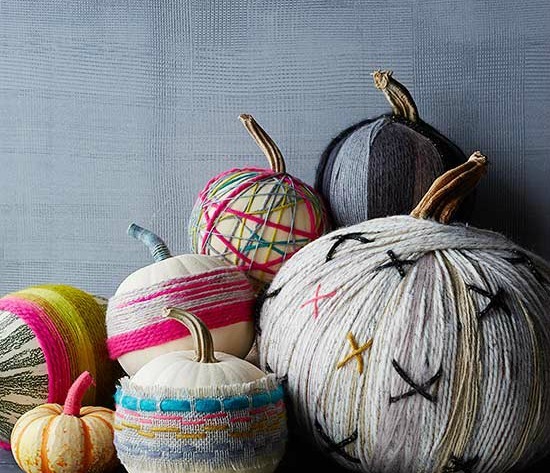 Instead of carving or painting your pumpkins, try wrapping them with yarn. We'll show you how to create a variety of patterns. 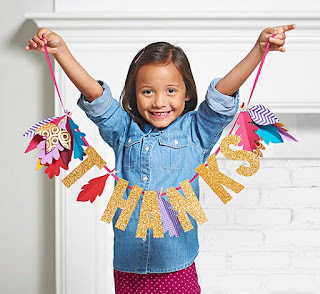 This pretty Thanksgiving craft might be our favorite way for loved ones to show their thankfulness during the holidays. Cut out leaf shapes from colored paper or old book pages -- choose colors that match your existing decor to create a piece that fits right in! Then have family members write thankful messages on each leaf and attach them with push pins to a linen-covered cork board. 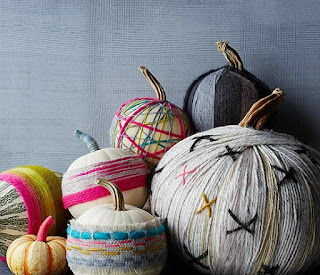 Dress any mantel or doorway with this quick and easy Thanksgiving craft. Plus, it's a great project for the kids to help with! Just cut leaves from colored paper, then glue to ribbon or string along with store-bought glitter letters. Thanksgiving table decor doesn't get prettier than this. 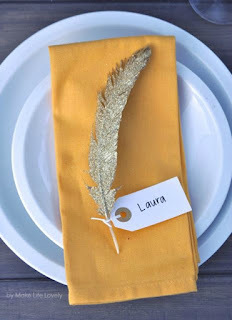 We're loving this gold-dipped feather place holder from Make Life Lovely. The glittery feather will complement your deep fall colors while giving the entire Thanksgiving table setting a glam look to celebrate the season. Homemade Thanksgiving decorations don't get much trendier than this. 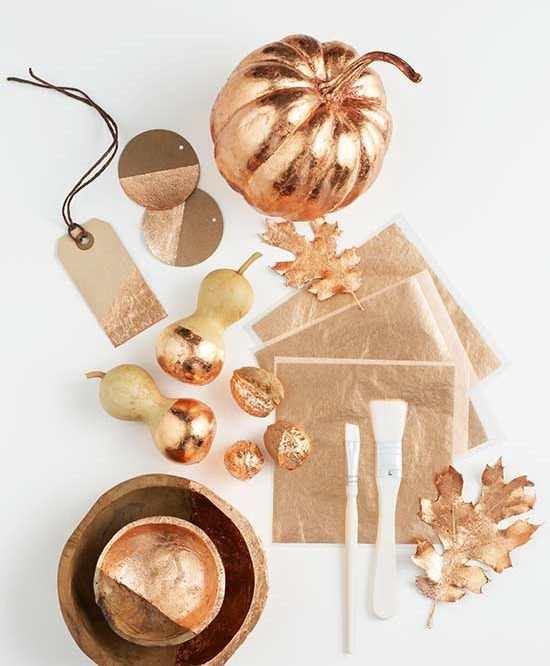 Look to copper leaf and adhesive to glitz up to your Thanksgiving table decor. Make golden gourds, acorns, serveware, and more! Use painters tape for perfect lines. A toast to the season! 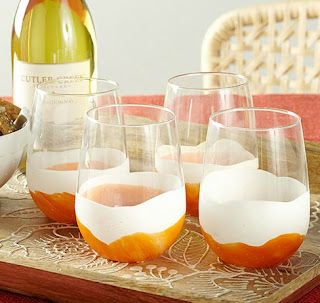 Starting with stemless wineglasses, gather white, orange, and black enamel paint (the black is to tint the orange). Pour the white paint and the tinted-with-black orange paint into individual bowls. Dip the glasses first in white, allowing excess paint to drip off; let dry. Dip in the orange paint; let dry. Though these glasses are not dishwasher safe, they are easy to clean with light soap and water.